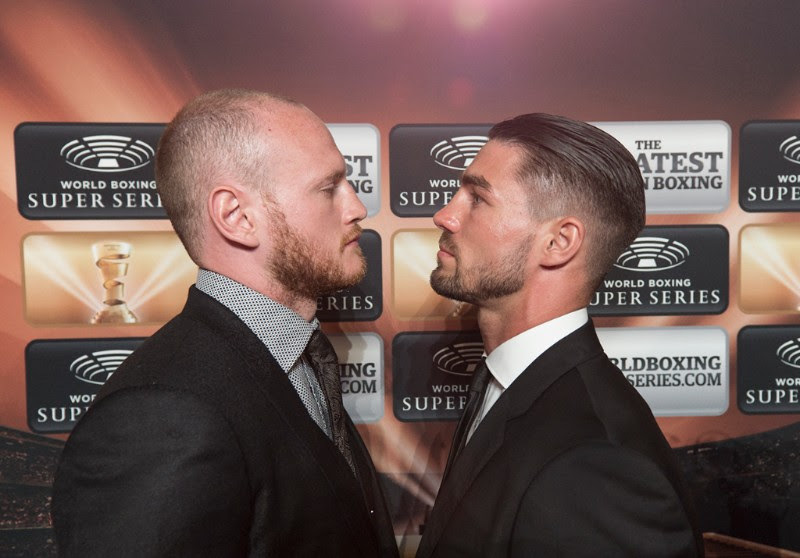 WBA Super World Super Middleweight champion George Groves (26-3, 19 KOs) and Jamie Cox (24-0,13 KOs) went head-to-head at the last pre fight press conference before their Ali Trophy quarter-final on Saturday at The SSE Arena Wembley in London. “I feel I’m in the form of my career,” said Groves. “This tournament has come along for me at the perfect time. I’ve had a fantastic camp. Everything that we wanted to happen did happen. It’s gone perfectly. I know what Jamie Cox can bring. I know that we maybe haven’t seen the best of Jamie yet because he’s fought nowhere near the level that I have. “I am here with two absolute athletes. George Groves, the man to beat in the tournament. He’s the WBA super champion, the best super middleweight when one looks at all the names. That’s why he’s the number one seed. A lot of people are talking about a Eubank Jr. vs. Groves semi-final but Jamie Cox comes in with a nothing to lose situation. He’s an undefeated challenger and you have a storyline that you couldn’t put into a Hollywood thriller. “Jamie Cox has been talked about for a long, long time as a great fighter, a great puncher. The world around the business is that Jamie is the real deal. It’s only when you step up to this level that you find out if it’s true. And if it is true I believe he can win the world title on Saturday night. “George Groves has always strived to be the best that he can be. He’s got a very confident attitude but he’s still putting in all the graft. The camp has gone fantastic, it’s been 12 great weeks. Tickets for the Ali Trophy quarter-final clash on Saturday in London are on sale ranging from rom £35 to £130 at stubhub.co.uk. Organised by Comosa AG, the World Boxing Super Series will kick off in September 2017, featuring the Cruiserweight and Super Middleweight divisions. In each weight class, eight elite boxers will battle it out in a bracket-style elimination tournament, with four quarter-finals (fall 2017), two semi-finals (early 2018) and one final (May 2018). This makes for seven top fights per weight class, and a total of 14 fights in Season One to be staged in premier venues around the globe. The winners of the World Boxing Super Series will rightfully receive The Greatest Prize in Boxing, the Muhammad Ali Trophy. Please visit our website WorldBoxingSuperSeries.com for more information or follow @WBSuperSeries on Twitter, Facebook, or Instagram.